It's a world of laughter, a world of tears. It's a world of hopes and a world of fears. There is just one moon and one golden sun. Though the mountains divide, and the oceans are wide. At the 1964 World's Fair in New York, the very first incarnation of the ride, "It's a Small World," intended to be a salute to UNICEF and children around the world. In collaboration with Disney, Pepsi sponsored the successful attraction, which attracted millions of people in two half-year seasons. One of the main keys to success was the number of people the boats brought through the exhibit per hour. While people spent hours standing in line at other attractions, the line was always rather short at this particular ride. After the World's Fair, the ride ended up at Disneyland in Anaheim, California, minus the "The Tower of Four Winds," a 120-foot kinetic structure with vanes, propellors, and other moving parts. 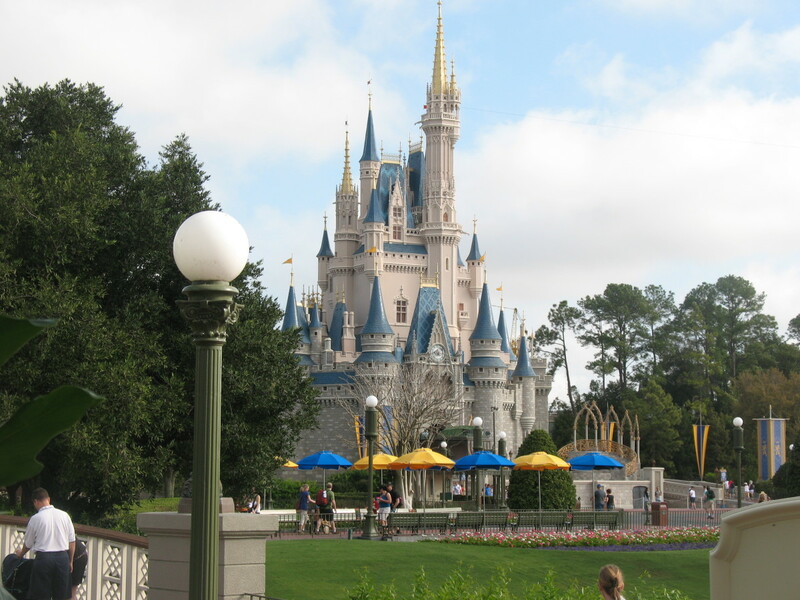 Instead, the now famous three-dimensional façade with cutout turrets, minarets, and towers, including the the 30-foot smiley-face clock which ticks and rocks back and forth. Although the original façade has been painted different colors over the years (all white with gold and silver trim, different shades of blue, pink and white), it is currently all white with gold and silver trim. 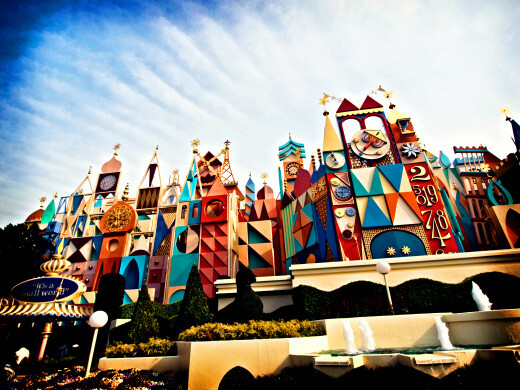 Situated in Fantasyland, the original "It's a Small World" ride takes people on the "happiest cruise that ever sailed." Over 300 animated dolls, representing 100 world regions, are colorfully displayed for passengers. 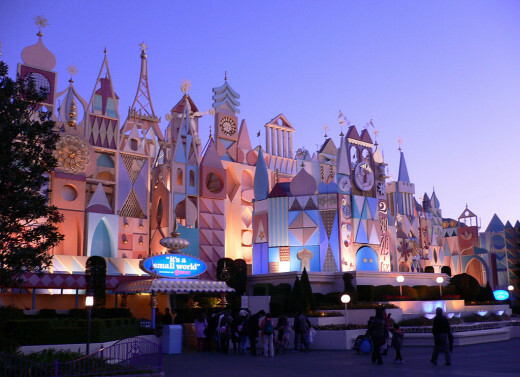 Mary Blair, a legendary Disney artist, designed the ride with whimsical settings that match up well with the "It's a Small World" song, written and composed by Richard and Robert Sherman. As the boats exit the exhibit, there is a Finale Room which contains representatives from all the cultures dressed in white versions of their native costumes and singing the song in English. This room is followed with a Goodbye Room with three-dimensional cutouts of stamps, postcards, and airmail envelopes. 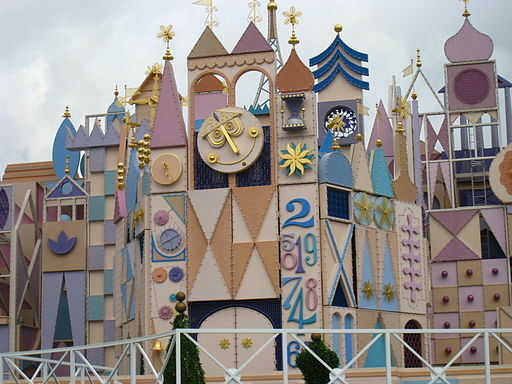 Due to the immense popularity of the "It's a Small World" ride, it is one of few attractions that has been replicated at every single Disney theme park around the world. Originally named Euro Disney Resort, Disneyland Paris is in Marne-la-Vallée, an eastern suburb of Paris. 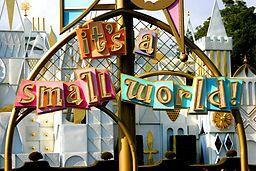 When this European version of "It's a Small World" went in, it was built a little bit differently than it's counterparts in other regions of the world. First off, the exterior clock on the façade features an awake sun on the left and a sleeping moon on the right. The music and scenery are done in a different style, making it more ornate and symphonic. The façade is extremely colorful, with medium-toned pastel shades throughout, and is larger than any of its counterparts. Instead of representing the Canadians in the Polar Regions with the Scandinavians, the separate North America room houses the United States and Canada. Disneyland Paris' "It's a Small World" also houses a Middle East room with the song sung in Arabic. As guests enter the Finale Room, the song is sung in English, as with the original, however, it is also sung in French and German. 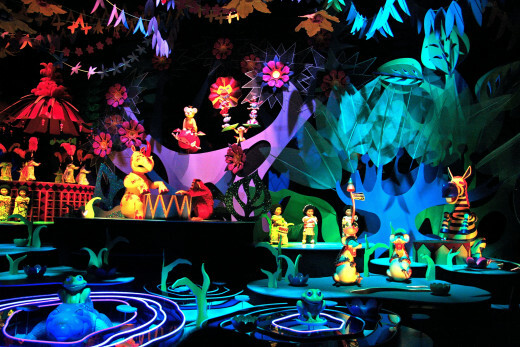 Hong Kong Disneyland's "It's a Small World" ride opened in 2008 with the familiar Mary Blair-style scenes. They added 38 Disney characters to the displays. The façade is painted similarly to the one in Tokyo. 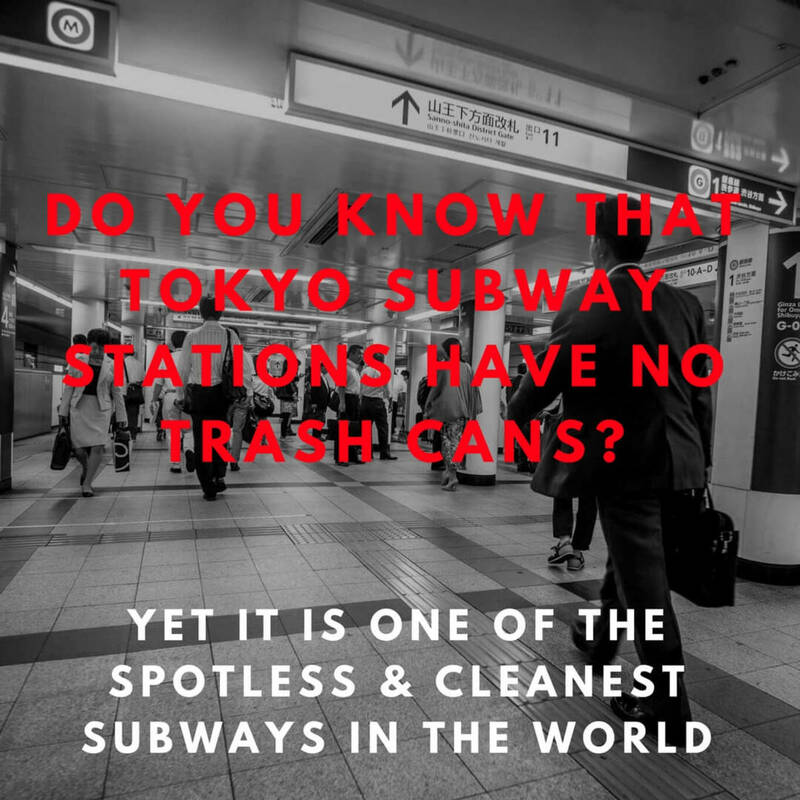 In Tokyo, the colors were relatively evenly represented. Also with a beige background, the Hong Kong Disneyland façade has a blue tone to it. In Hong Kong, the ride features an expanded Asian Room, a Middle East room, and a redesigned North America section. Simliar to Disneyland Paris, the North American room represents both Canada and the United States. The entrance to the ride is to the right of the clock in Hong Kong. The Finale Room is the one that makes the Hong Kong "It's a Small World" ride the most unique. It features fiber-optic lighting effects that amaze passengers and provide them with an extraordinary experience. Through this room, the song is sung in Cantonese, English, and Mandarin. There's no doubt Walt Disney created "the happiest place on earth" for people, and "It's a Small World" is certainly one of the happiest cruises people will ever experience. This signature ride at all Disney theme parks around the world continues to be on the Top Five Attractions lists. Families enjoy this experience together and talk about it for the rest of their lives. Mind you, it's also a great place to cool off in the middle of the day. Being an indoor ride that lasts roughly 10 - 15 minutes depending on which location, it is a great opportunity for theme-park goers to cool down and enjoy cheerful entertainment at the same time. DDE: Thank you. I hope you get to visit one of these locations at some point in your lifetime. They truly are magical places. Thanks for reading! Awesome looks a wonderful place to visit with great entertainment, and you shared such lovely photos.